“Doro Kara Don Don Don”: If you can say it, you can play it! Come try playing taiko with our ongoing Beginner Taiko Drumming Classes. You can begin in any session and renew per session. Classes are held once a week for 4 weeks. 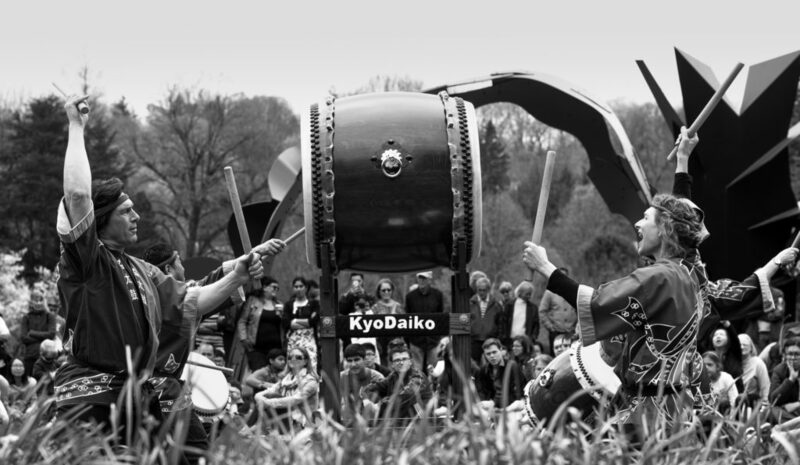 This session will focus on the dramatic “odaiko” style of drumming where the drum is put up on a tall stand with the drum head perpendicular to the ground. We will teach you everything from proper stance, how to hold the drum sticks, and striking technique and styles, in addition to teaching you about the history and traditions of taiko. Classes are open to adults of all ages, musical backgrounds and experience. In fact, no experience is necessary. Children 12 and over are also welcome with parental supervision. Wear comfortable clothing and non-slip shoes like sneakers. It’s a good workout, so you may want to bring a bottle of water too. LOCATION: Classes take place at our dojo in the Defensive Arts Center, located within the Greenbriar Club Apartments Complex at 3901 Conshohocken Avenue, Philadelphia, PA, 19131. Entrance to the complex is across W Country Club Rd. To sign up for future classes, please click on “Other dates…” in the registration page above. Playing taiko is a lot of fun and is also a great workout, we hope you’ll join us soon!